Here's an ongoing running list of road/traffic issues as they are reported this week from the facebook/twitter pages and text/emails. Tuesday April 3 – Report that 321 in Blowing Rock down to one lane near intersect 321 bypass/business before Canyons. Expect delays. Update 12pm- spoke to NCDOT, the delays this morning were very minimal. There are no lane closures planed in the immediate future. There could however be minimal delays with flag man present from time to time as needed. Along with 321 in Blowing Rock delays also got a report of switching the lights from App Ski Mtn to Tweetsie on 321 as well. 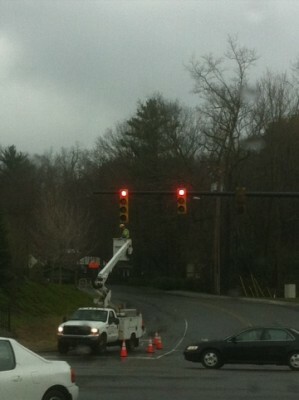 11:26am- crews are still working on the lights at New Market and 421 across from movie theater.